It has been quite amazing, and the country is definitely seeing the fruits (GOOD FRUITS) of these efforts. Yep! 86% of Republicans approve of his success. Reuters Poll as of Feb 18 was 85.8%. I went back and checked and revised data shows it has fallen slightly in the last few days. Are you a liberal too? You have to be blind or willfully ignoring the President's success to not see it. You mean OUR president, unless you are from another country. No, he is definitely not liberal (thank God). That being said, given what you said and where/when you said it it seemed as if you were mocking the president and doubting his accomplishments. Your later posts verified that suspicion. Wow! If you love America, you can truly Rejoice! Trump's economic policy, by the hand of God, has done great things! God seems to be blessing this nation and its new direction. I rejoice over the performance of the American economy over the last fourteen months, just as I'm sure you rejoiced over the uninterrupted decline of the unemployment rate during the final seven years of the Obama administration (aided by 75 consecutive months of job growth, it fell from 9.8% in January 2010 to 4.8% in January 2017). For the last month or so, Gao Lu, I’ve been tempted to ask you to clarify your view of President Trump. As time has passed, the evidence needed to serve as the question’s foundation grew, but I resisted. Until now. What if it isn't about Party Water or foibles of the President, but about watching God at work, trusting Him, about obeying Him in praying for our leaders and not passing on gossip or speaking ill of "the king" whom God has set up? As was clear above, Christians are not saying Trump represents Christian values or that we endorse his sins. We are saying (for the umpteenth time) that he better supports Christian values than those who came before him. Watching the speech I thought it sad that Democrats often sat looking sullen, bitter and un-American. That can't be good for their Party. Yet such negativity was powerfully overwhelmed by the joy and kindness and strength of the message of hope offered by Trump and reflected by 80% of Americans. 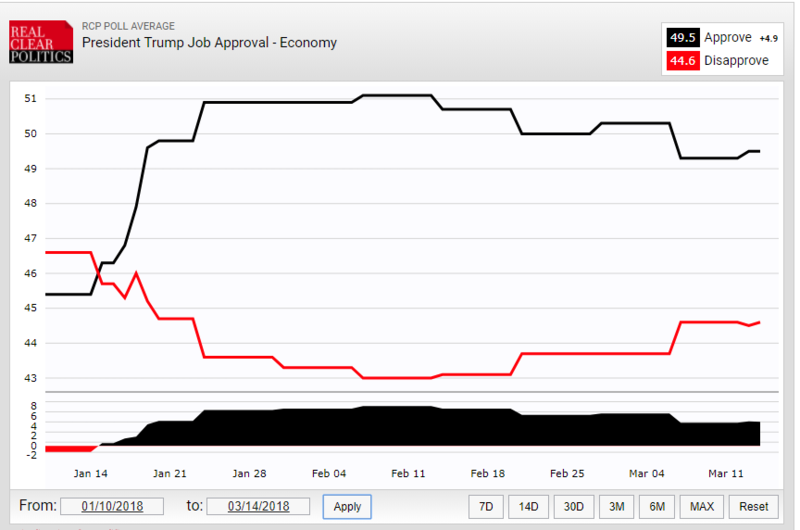 Trump continues to excel as his popularity rises. Perhaps for some reason, you did not realize that I was referring to the attitudes expressed by some forum writers. Your statement, seeing everything in grime and blackness--even the success of the best President we have had (whom I don't like at all) in decades. Christians and a lot of other Americans are liking that better all the time. Trump is not one's choice for pastor, but he is clearly God's choice for president today. What I don’t understand, and I hope you will explain, is how for you, Donald Trump is “the king" whom God has set up, a president whose new direction God seems to be blessing, a man who supports Christian values better than any president in recent times, who continues to excel as he speaks joy, kindness, strength, and hope, whose economic policy has produced great things by the hand of God, and who is both the best president we’ve had in decades AND clearly God’s choice for president today, BUT YET, he is also a president you didn’t/wouldn’t vote for, and a president you don’t like at all. Why DON’T you like him at all? You think he’s God’s choice and the best president we’ve had in decades! If you don’t like him at all, why have you posted so much praise of him, his job performance, and his ordination by God to the office? And if you don’t like at all God’s successful choice as president, whom WOULD you like? We have fundamentally different worldviews. You are wrapped around the axel of politics and people. I am interested in how God works among nations and people. I live internationally and favor no one country of people over another. Who is president matters little to me other than to observe with interest how God is working. Yes, Trump is the leader, king if you will, through whom God works. I believe that. You do not. Our nation is dramatically improving many ways under Trump's leadership. I see that. You do not. I don't care for Trump. I don't think he is Christian ( a babe at best), or at all represents Christianity. I wish he was Christian, but that matters little for our conversation. He has slowed America's descent into destruction that other leaders brought upon us. For that I am thankful and rejoice. We are moving back upwards in many ways. I have no interest in being a negative sourpuss and clutching to my heart handfuls of darkness, anger, bitter poison and then spewing it back out on others. Many today seem to live in that horrible black miserable pit. My call is to come out and into the sunlight of love and freedom. Now, I am sure you understand fully and well. Climb up! The air is great! The sunshine feels so good! Why DON’T you like him at all? His personality is definitely not my cup of tea. I think he has lived quite immorally. Yet I deeply respect the fact that God placed him where he is and works through him. He could have no power at all if it were not given to him from above. You think he’s God’s choice and the best president we’ve had in decades! If you don’t like him at all, why have you posted so much praise of him, his job performance, and his ordination by God to the office? I would invite you to think a little bit and ask that question again if you really mean it. I think you are smarter than that. Much more able to think than that question indicates. You are saying things I didn't say. Speak for yourself. I won't bother with troll questions. I am looking forward to when Jesus is Lord of all, when the evil in the world is ended. That King I love and long for. That King has my vote--all of them, forever. He is my Lord and Savior, my God. His name is Jesus. I invite you to consider Him. When you do, the things of this life will grow strangely dim. Who is president may not matter much to you, but the fact that Donald Trump is president has mattered enough for you to have created two threads to direct our attention to him: this current thread, focused on what you deem his "amazing success" in office, and a thread in which the focus was what you termed his "fantastic" and "inspirational" State of the Union address. You claimed more than that "God works" through Donald Trump. God can WORK through all kinds of people - even you and me. You claimed that God chose Donald Trump to be president. I don't care for Trump. I don't think he is Christian ( a babe at best), or at all represents Christianity. I wish he was Christian, but that matters little for our conversation. Or, as you stated in another post, in your view Mr Trump DOES "better (support) Christian values than those who came before him." I am challenged by your complete dislike - on whatever grounds - for a person you believe God has specifically chosen for the job, someone who is succeeding greatly, you believe, by the blessings of God's hand. Do you know of a biblical example of the total dislike of a person joined with praise for God's choice of him or her for that role, and applause for the person's performance in that role? I'm think I'm glad you think I'm "smarter than that," and "much more able to think than that questions indicates." Though I have to say your praise has a decided faintness to it. But fortunately for us, whether I'm smarter or more able to think than "that" is no more germane to the question I asked than what you might be smarter or more able to think than, so I'll ask my question again: You think he’s God’s choice and the best president we’ve had in decades! If you don’t like him at all, why have you posted so much praise of him, his job performance, and his ordination by God to the office? ME: "...you don't like at all"
YOU: "Perhaps for some reason, you did not realize that I was referring to the attitudes expressed by some forum writers. Your statement, seeing everything in grime and blackness--even the success of the best President we have had (whom I don't like at all) in decades. ME: God's successful choice as president"
As for your belief that God chose Trump, for unknown reasons, the post from which I copied and pasted the line I quoted previously is no longer available in the forums. I don't know what happened. This quotation will have to suffice.'.. YOU: "Trump was God's choice. Hillary was not--she didn't have a chance." That documented, exactly what part(s) of my characterization that "you don’t like at all God’s successful choice as president" do you contend are "things (you) didn't say"? Let there be no more confusion, I claim both are true and as you should know from Seminary and Bible reading, are true from the Bib....oh that's right, you don't believe it to be true. Well, I do. So we have that fundamental difference. You probably don't get this either, but I don't hate Obama at all. I would think you were making this up, but apparently not. So I will chew on it a moment. I can celebrate any good thing that happens. I can celebrate the work of God however it is done by whomever God chooses to do it. That has nothing to do with the likeability of the person by whom God chooses to do a thing. Do you actually vote based on how well you personally love or hate a person? You seem to have a complete disconnect, inability to see such a thing. I can't imagine seeing it any other way. Well...that is enlightening about our different beliefs. Apparently, for you, everything is about politics and people and whom you love or hate. For me its all about God, His glory and delighting at the wonder of how He works. Yes, such worldview differences are fundamental to the Bible (which you reject as Truth) and certainly explain well why we see things so differently from each other. I am disappointed you feel that way. If you could see my body language and hear my tone, you would know my love and sincerity. What is germane about your "smartness" as discussed above is that I have a hard time believing you are kindly, respectfully asking questions and not just using every political trick you ever learned to twist things to win some kind of imaginary battle you have in your mind. Frankly, you don't come across to me as honest. Probably you have a cause that motivates you. Probably you are intent at any cost to proving you are right (mainly to yourself--because likely, no one else cares that much). I just don't see the difficulty you seem to have with it. Of course that is what I think. Pretty simple. In brief summary, I don't care for the man. I did not vote for him. I believe God sets up and takes down rulers of nations. I believe God turns their hearts in some measure according to his sovereign will. I am not that thrilled with Trump, but I am thrilled with God! I am thrilled with the good things Trump is doing! You know, Kim Jon Il is not a very likable fellow, and he does a lot of very bad things. Yet I am quite happy when I hear of good things he is doing for his country--and there are some. ME: **"...you don't like at all"....that documented, exactly what part(s) of my characterization that "you don’t like at all God’s successful choice as president" do you contend are "things (you) didn't say"? Huh? I meant what I said without apology. I was clear. I don't care much for word games of the sort you relish. Especially political ones. Stay logical and don't troll and don't set up straw men, and don't flash red herrings, and I will have far more interest. Otherwise...nah. Bill, I just don't have much stomach for hate and diatribes and imaginary battles over stuff that to me is a fly on the wall. I am about the goodness and glory of God and how He is working through and in people. Can we sort of shift our politics that direction? That is really the extent of my interest in the topic. As for your celebrating the economic recovery during Obama's presidency, good. Good economic news is good economic news, whoever is president. As for your feelings toward Obama, I never claimed that you hate Obama. In fact, I don't believe you hate Obama. I guess that means I get that you don't hate Obama. Instead, I take you at your word from your posts, in which you said you consider Obama's presidency "godless" and that Donald Trump "better supports Christian values" than did Obama. I've twice asked whether you know of a biblical example of the total dislike of a person joined with praise for God's choice of him or her for that role, and applause for the person's performance in that role. Now I ask a third time. My dislike for Mr. Trump, for example, was and continues to be based primarily on his unfitness for office. His contemptible treatment of a NY Times reporter with disabilities during the campaign displayed that unfitness. Presidents of the United States don't respond to people that way. His pattern of pathological lying both before and while in office is disqualifying, in my view. No one in the history of the American presidency has EVER lied as much or as regularly as Mr. Trump. To me, that's disqualifying. As a result of that conduct - and of course, much more - I dislike Donald Trump, and my dislike for him means I will never vote for him. His views on issues are not as important because, in my view, he doesn't have core policy views. Recall how he flip-flopped within 24-48 hours on both a bipartisan immigration bill and the possibility of raising the age of assault-style weapon ownership to 21. YOU started the thread in which you praised Mr. Trump's State of the Union speech. And YOU started this current thread, in which you praised the rapidity of Mr Trump's completion of his agenda. When you read your OPs in those two threads, you will not find praise for God, whom you say "it's all about." You will find praise only for Mr. Trump. That's fine!!! But offer an accurate picture of your posts' content. Discussions in CD threads are to be about ideas, not people, so your analysis of my honesty and intentions - not to mention your earlier contention about about my "disconnect" and "inability" - is inappropriate. But I'll give you a free one. I am honest. I ask the questions I ask because I want to know the answers. And many of those questions are rooted in the principle pounded into me by my high school debate coach: If you assert a fact, you'd better be able to back it up. If you can't back it up, don't assert it. You reference Trump and Kim Jong-un in the same paragraph. We have found common ground! Huh? I meant what I said without apology. I was clear. Your claim in an earlier post was simple: "You are saying things I didn't say." You said nothing about the role of "apology." The only item to which your claim could have been a response was the summary contained in the question I asked: "And if you don’t like at all God’s successful choice as president, whom WOULD you like?" My response to you simply showed that my summary was accurate; you DID say those things (though whether with or without apology, was not clear). If your interest is God's goodness and glory, great! But in my view, when you start threads as you did, that praise Mr Trump, not God's goodness and glory, you shouldn't be surprised when responses in those threads turn more conventionally political. ...I take you at your word from your posts, in which you said you consider Obama's presidency " and that "Donald Trump "better supports Christian values"" than did Obama. Yup, pretty much. Good catch! I would say most if the Kings of Israel and most of the kings around them. Most weren't very good and many weren't especially likable, yet all probably did some things good, more or less, and God was in control ever every last one of them. Probably there aren't many kings that don't fit your description from the Bible. But you know that. But don't believe it to be certainly true, so why waste time pointing it out? See above. See if that covers it. I didn't vote for him either. You have been very extensive in explaining and re-hashing your litany or reasons for disliking Trump. You say you do not hate Trump, but your endless diatribes sound like hate to me. Maybe see if you can change that if you really don't hate him. There is a great physician I know you can see for a spiritual implant. His name is Jesus. YOU started **[the thread in which you praised Mr. Trump's State of the Union speech...[blah blah blah]... your OPs in those two threads, you will not find praise for God, whom you say "it's all about." You will find praise only for Mr. Trump. That's fine!!! But offer an accurate picture of your posts' content. Yep. I did. I am thankful for positive things happening in America, for God's hand of grace and for Trump's part in that. For me it's not about politics, but about God, his glory and his people. I say that too much, don't I? Bro, go get that spiritual implant and you will hear and see like never before! Trust me! Will save us both a lot of work. Discussions in CD threads are to be about ideas, not people, so your analysis of my honesty and intentions - not to mention your earlier contention about about my "disconnect" and "inability" - is inappropriate. But I'll give you a free one. I am honest. I ask the questions I ask because I want to know the answers. And many of those questions are rooted in the principle pounded into me by my high school debate coach: If you assert a fact, you'd better be able to back it up. If you can't back it up, don't assert it. For me, Christian Discourse is not a high school debate class. I suppose we have very different purposes here. I shall pursue mine and you are free to pursue yours. If your interest is God's goodness and glory, great! But in my view, when you start threads as you did, that praise Mr. Trump, not God's goodness and glory, you shouldn't be surprised when responses in those threads turn more conventionally political. I like chocolate chip cookies too. I care about politics a teensy bit. You got a problem with that? I will likely start more such threads. I hope that won't unwind you too badly. I have great respect for our president and pray for him. I am thrilled at good things happening. Expect more of that. I am really impressed by the gracious hand and goodness of God. I really wish you could get to know Him! I can't change how my "diatribes" sound to you. But I can tell you that you're drawing the wrong conclusion about my regard for Mr Trump from how they "sound." I don't hate him. I wish him well and hope he lives a long, productive, and satisfying life. But I also believe he is in almost every conceivable way unfit for the office he holds, and that he is bringing shame, disgrace, and harm to the office he holds and the institutions of the government he heads. Of course, I wouldn't have to tell you that you're drawing wrong conclusions about me were you to comport your posts to the expectation of these forums that we will criticize each other's ideas, not each other. Thanks, but in this case, what matters is that WE have been given an EXPECTATION that in these forums we will conduct civil discussions in which we will criticize each other's ideas, not each other. Wow! Bill said this! Let it be known and never forgotten! Written on a pyramid! "I wish him [America's President, Mr. Donal Trump] well and hope he lives a long, productive, and satisfying life." Give me a reason to think other than anything I have written. Of points I have written, I challenge you to prove one single point wrong. You would totally make my day! Thanks again for clearly stating your personal EXPECTATION. I didn't ask you to play a "game," Gao Lu. I asked you to cite one king of Israel who fit the description I offered earlier in our discussion. I assumed you would find that a simple task since, in your view as you stated it in your previous post, "most of the Kings of Israel and most of the kings around them" fit that description. The CD expectation that we will criticize each other's ideas, not each other, has nothing to do with the accuracy or inaccuracy of our criticism of each other. It has to do with the propriety of such criticism IN THIS SETTING. Think parental reminders to children about "inside voices" and "outside voices," which don't address the accuracy of what the children have said, but rather the propriety of the voice with which they have said it IN THEIR SETTING. You are, of course, welcome to the opinions of your choice about me. But the only criticisms that are appropriate IN THE SETTING OF THESE FORUMS are those of my ideas. To engage you on the validity of your recurring personal attacks against me would validate your practice of launching personal attacks against people with whom you disagree, it would validate your use of an "outside" (these forums) voice in this "inside" (these forums) setting. I won't do that. The expectation is not mine; it is the forums'. You know Bill, you are so worried about people following the forum guidelines but you don't even follow them yourself. Below is from the same guidelines you so often like to throw out there. It’s everyone’s job to make this forum a healthy, happy place for discourse. When you see bad behavior, don’t reply. A reply consumes energy and draws more attention to the offending post. Just flag it. When enough flags accrue, action will be taken, either automatically or by a moderator. You raise an interesting point, David. Thanks. Post-flagging, which is invisible to everyone other than the one creating the flag and the forums' administrator, is an indirect, and likely impotent, approach to the problem. I tried flagging posts in the previous iteration of CD, to no result. That trend is unlikely to change given the small number of active participants in this new edition of CD. In addition, I think the reality is most posters are unlikely to flag posts whose "bad behavior" does not affect them personally. I recognize/confess that when it comes to "proper" discourse, I am a fundamentalist. I hold VERY strong views about what's appropriate and what's inappropriate when it comes to expressing differences of opinion - with fellow Christians, of course, but with any other person, as well. Invisible flags placed on offending posts do not give voice to my convictions. I am also an evangelist when it comes to my views on appropriate communication. I am convinced beyond doubt that name-calling is wrong; I want others to know that, and to choose to conform their communication to that principle. I am convinced that we ought to criticize ideas, not people. I want people to know that, and to choose to conform their communication to that principle. Invisible flags on posts offer no occasion to pass along that counsel. These forums certainly testify to how difficult it is to get people to change their basic approach to posting; but that doesn't deter me from my evangelistic efforts. Then there's the issue of accountability. People who violate CD expectations should be held accountable for their actions, much in the way by your latest post in this thread I think you seek to hold me accountable to another CD expectation. All that said, I take your point about the existence of other ways to process my objections to posts. Certainly, debating with Gao Lu the meaning and necessity of the "criticize ideas, not people" expectation was not a productive use of my posts. That's an approach I need to change. US approval poll of Trump on the economy is 51% (avg of several major polls)a. Only 43% disapprove (guess who they are!). All that in spite of unprecedented presidential media attack. Yes, God is in control. In spite of all the fake news, America is warming to the truth substantiated via a plethora of government statistics on the economy. In spite of a year of fake news frenzies pushing conspiracy theories, Americans are tuning out the neurotic noise to focus on what Trump has actually accomplished. To the many with vision, those not blinded by hate and anger, the accomplishment actually matter. When the scales fall from their eyes, Americans like what they are seeing. Why? SOTU was truly great, debunking of the Russian investigation and media's ridiculous rendition of Trump's tax cuts. There is more to be gained on that, we would expect. 75% of Americans loved the SOTU speech. 62% called it "excellent." 62% of viewers say they believe Trump is moving America the right direction." In a strange twist, even a whopping 43% of Democrats approved. Yes, Trump is turning the tide, against the unprecedented onslaught of the media, and even winning Democrats. How fun to see God so clearly at work here. We can only pity those too blind to see yet! We can see the gap is closing, in spite of the media and the trend is that Trump will soon overtake Obama in spite of the media and the angry liberal howling at the moon. Character assassination is failing. God can use anyone and do anything He chooses. An interesting example of media failure was the efforts to cast Trump as having offended 3rd world countries, especially poor countries such as in Africa. Yes, a few countries, poked and prodded by media politics to maybe get another American handout, criticised Trump. Yet, Museveni, Uganda's president said, "America has got one of the best presidents ever." Fighting fake news with truth will triumph. We know the last chapter of the last book of the Bible. [spolier alert] We know how the story ends and it ends well. Oddly, liberals don't seem to need to be cast into outer darkness. They seem blind already and running pell-mell into anger, fear, darkness, blindness all by themselves. I think Prov 28:7 speaks of those tormented by guilt, that flee to the pit. Just never thought it would happen like this. It's time to point out the foolishness of arm-chair analysts, those who don't really know diddly-squat, who analyze and fume. Many of these are those who have abandoned their positions of Christian authority. These, it would appear, God keeps in darkness, bound in chains of their own forging--angry link by bitter fetter--until some future judgment. Note: Just to be clear...any "warning" thoughts above are not directed toward any specific individual on this forum. They are intended to reflect what we see in society at large in the light of God's Word. Thanks for the information, tho not impressed. The chart above his approval is rapidly falling. It, not Mr. Trump, it's God at work. In sum, "God can bless any mess..." "but He doesn't need mess to bless." Where did you learn to read a graph, Walmart? Um..... wow.... I don't even know what to say here..... You really are in left field on this one. The significant challenges to the graphs you presented, Gao Lu, have to do with both content and context. * The other contextual matter is the fact that Trump's favorability on his only/signature area of accomplishment during his first year stands at mid-field with the economy doing "great" (his word). Where would Trump's handling of the economy number have been over the last year had he faced the economic disaster Obama faced during his first year? I have to ask, Gao Lu: You seem to share the president's passion about "fake news." 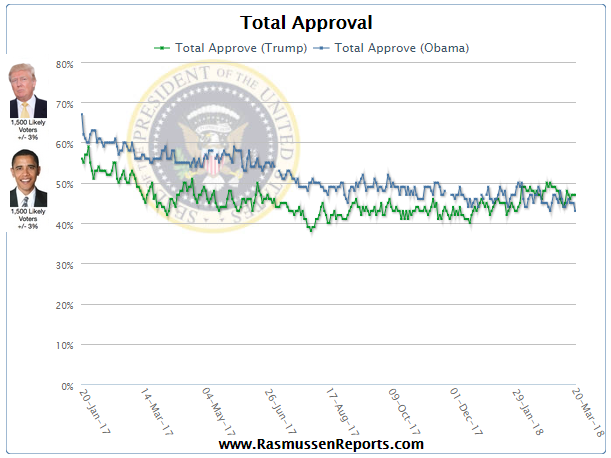 Does it qualify as "fake news" to you that Rasmussen compared the first years of Trump and Obama without reporting the very different economic conditions the two men faced? Or perhaps, does it qualify as "fake news" that YOU presented a comparison of the two presidents' first years without reporting the very different economic conditions the two men faced? Thanks, Bill, for the context of the situation. I have serious reservations rather some here wants the truth, contextual comparisons, and the truth of Mr. Trump's popularity. The OP is laughable, to begin with. Success is something one experiences at the end of years or a task. It's independently proven and observed by others. If you have to say it, then maybe it's not? This should be at the end of his term. Only a child is given very short interval to stay motivated. What is Mr. Trump? Thanks, Bill, for the context of the situation. I have serious reservations rathe some here wants the truth, contextual comparisons, and the truth of Mr. Trump's popularity.